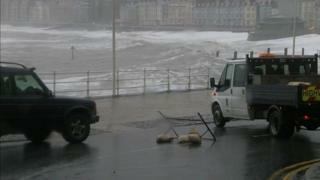 Storm-threatened coastal towns should be protected by a national sea defence programme, an Aberystwyth councillor has said. Debris was being cleaned up from the front after Storm Brian hit the Ceredigion resort over the weekend. While town councillor Alun Williams called damage "superficial", he said many towns could be "under threat" from high tides caused by severe weather. The Welsh Government said funding is prioritised based on risk to life. Speaking to BBC Radio Wales' Good Morning Wales programme Mr Williams said: "Wales as a nation has sea on three sides and if key towns like Aberystwyth are under threat, many others must be also. "We need a national programme for sea defences. "Councils are happy to help, but 15 out of 22 have a coastline, which means major infrastructure planning at all levels is needed." Echoing his calls, Richard Griffiths, who runs the Richmond Hotel on Aberystwyth's sea front, described the current defences as "old, tired and brittle". Ceredigion council said Marine Terrace from the junction on Terrace Road to the junction on Albert Place will remain closed to vehicles until 12:00 BST on Tuesday due to clearing and repair work. While Mr Griffiths said the latest storm did not cause the same scale of damage as one in 2014, he pointed to large boulders that make up the sea wall being knocked out of place by waves. He also said small bricks that formed the surface were "tossed around like confetti". "We have to look seriously at how we can improve it. In parts, maybe taking away the old Victorian defences and putting in new ones," he said. "Creating a curve shape that sends the impact of the waves back to sea. It is inevitable we will have to look at this. "There is no point patching it up as this is not going away because we will have storm after storm." A Welsh Government spokesman said it is for risk management authorities, such as Natural Resources Wales (NRW) and local councils, to put forward schemes to be considered based on local priorities. "We prioritise funding based on risk to life, using the communities at risk register, which combines multiple sources of flood risk, alongside local evidence," the spokesman said. "Over this government term we will provide over £144m to local authorities and NRW to reduce the risk of flooding and coastal erosion."